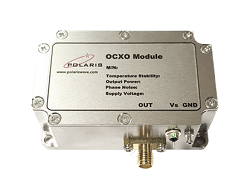 The PFRM-1 series is a Single Channel OCXO Module that provides a highly stable sine wave outputs. This series is categorized into PFRM-1-10 series which output 10MHz, PFRM-1-50 series which output 50MHz and PFRM-4-100 series which output 100MHz. PFRM-1-10 series is a Single Channel OCXO Module that provides a highly stable 10 MHz sine wave outputs. The OCXO with excellent performance, housed into this series provides a temperature stability from ±25 ppb to ±50 ppb over operating temperature range and aging of ± 100 ppb per year at 25°C. Also this series offers excellent phase noise performance of -165 dBc/Hz @10 KHz offset from 10 MHz Output. PFRM-1-50 series is a Single Channel OCXO Module that provides a highly stable 50 MHz sine wave outputs. The OCXO with excellent performance, housed into this series provides a temperature stability from ±25 ppb to ±50 ppb over operating temperature range and aging of ± 100 ppb per year at 25°C. Also this series offers excellent phase noise performance of -165 dBc/Hz @10 KHz offset from 50 MHz Output. PFRM-1-100 series is a Single Channel OCXO Module that provides a highly stable 100 MHz sine wave outputs. The OCXO with excellent performance, housed into this series provides a temperature stability from ±25 ppb to ±50 ppb over operating temperature range and aging of ± 100 ppb per year at 25°C. Also this series offers excellent phase noise performance of -165 dBc/Hz @10 KHz offset from 100 MHz Output.